2 layer board of 1.20 x 1.64 inches (30.4 x 41.6 mm). Uploaded: July 10th, 2016 20:33. -All silk readable w/o magnification! -I’m still using a 4x4SMD tact button but now nearly any switch you can find will work with a little solder mask scraping! -Provisions for >3S battery input! 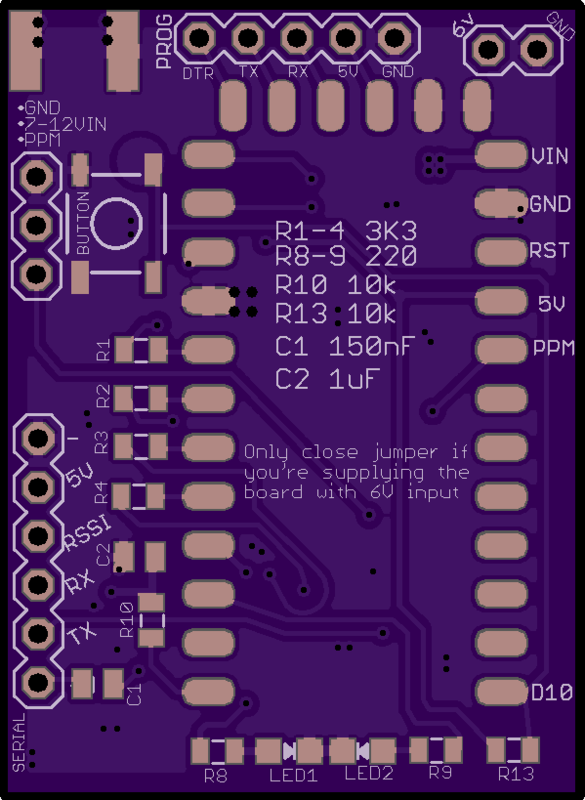 ATTN: You MUST file / sand the edges of the Arduino mini down so they essentially become board edge vias. Dont worry, this process is very simple and makes very clean looking edge connections that are very easy to solder with very minimal work. Quickly sand / file the board edges down about 2/5 of the way threw the vias. Note In the project thread on RCGroups I have pictured of built boards I’ve completed using a very strange Arduino Pro Mini clone with a double row of pins at the bottom for SPI and A4-A7, please DO NOT BE CONCERNED that you cant find that specific arduino clone, the pins needed for Ultimate LRS mini are all 1-to-1 compatible with the standard Arduino Pro-Mini and all it’s exact clones. 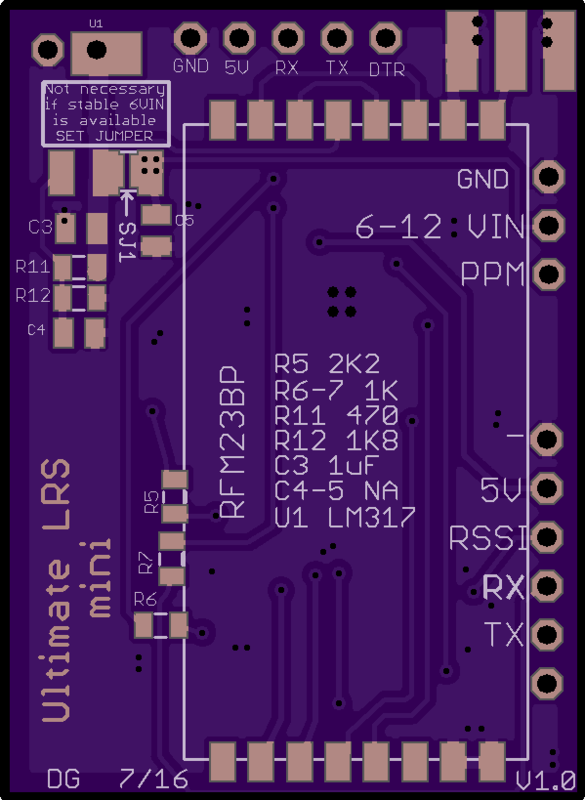 Pretty much any 328p mini board you find will work and ULRS is using the most common pins that are [even on boards with slight differences] always in the same spot! !